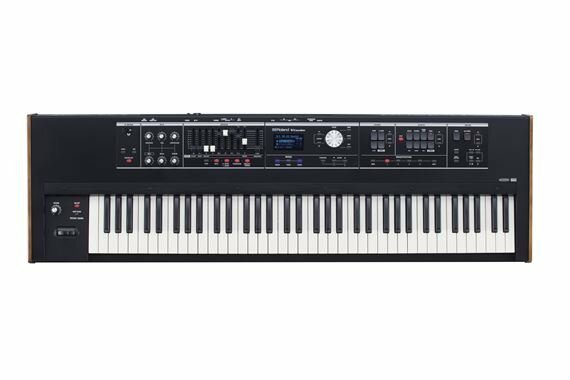 Order your Roland VR730 Live Performance Keyboard from AMS and enjoy 0% Interest Payment Plans, Free Shipping, Free Extended Warranty & 45 Day Money Back Guarantee. The V-Combo VR-730 delivers top-quality organ, electric piano, acoustic piano, and synth sounds in a travel-ready instrument with a 73-note waterfall keyboard. You don’t need to carry around that heavy vintage combo organ, rotary speaker, and traditional EP anymore—the VR-730 gives you the essential sounds and authentic playability you need while saving your back. The onboard organs faithfully respond to classic techniques, while the historic electric pianos—which include a selection from the acclaimed RD-2000 Stage Piano—offer impeccable tone and touch. With the smart user interface and direct access controls, you can focus on playing without being bothered with fussy adjustments and complicated settings. The V-Combo VR-730 is the perfect instrument for pro performers on the move, providing versatile, gig-ready sounds in a highly mobile package. Detroit-based soul/funk musician Amp Fiddler plays the ‘75 Tine EP’ sound derived from the RD-2000, enhanced with auto-panning tremolo and a deep reverb effect. Detroit-based soul/funk musician Amp Fiddler plays the VR-730 with a split keyboard setup. He’s using an electric piano tone (75 Tine EP) for the upper key range, and a synth bass tone (Chow Bass) for the lower key range. Powerful Soundsin a small keyboard! As a professional keyboardist sounds and lightness are important at a gig. The Roland Vr730 has an excellent combination of incredible organs. Pianos,synths and drums with great quick onboard effects and excelling split combinations. Over the last 40 years I have owned some high profile keys and this mighty board is bar none is the best small big sound keyboard in the market. Roland equals quality! This keyboard is perfect for what I want to do playing live. Simple basic operations with quick sound patch access to many great sounds. Well.... The FUNCTIONALITY is WEIRD at BEST ....... 1. The Pedal interface when one uses MIDI IN Port with Pedals is HORRIBLE.... NO CONTROL OVER PEDAL SETTINGS ...VERY BAD DESIGN.... 2. Layer CONTROL is HORRIBLE ..... 3. Speed control is BAD when Layered..... ... and on and on .... its like roland did NOT care about the end product ..... they should review THEIR VK7. First off, this thing weighs only 21lbs!! I’m coming from lugging around a 35lb Roland Juno DS88. As far as a keyboard for gigging musicians, this thing is dope! I play R&B, Soul and Gospel. It covers all those basses and more. The waterfall Keybed feels awesome. It has a straight forward layout that is easy to see on a dimly lit stage. The draw bars come in handy when playing organ. No regrets!!!! !